We make selling your Land Cruiser easy with our free FJ classifieds. If you are a private LC owner, you can list your Land Cruiser or Toyota truck quickly with our free online car classifieds service! If you are a dealer, we can list your Land Cruiser for a fee of $75. Simply fill out the form below and we’ll add your listing to our website. Listings typically go live within 48 hours. Once your Cruiser has sold, please email us at info@redlinelandcruisers.com so we can remove your listing from our website. Please note: only the copy you add to the description will be used in your post. We will not add your name, address, phone number or other personal information to your listing. That’s only for us in case we need to contact you. We will also set up an online form on your listing that will allow you to keep your email address private. Interested parties can fill out a form, which will be directed to the email address you provide us. Need cash fast? Use our paid advertising to extend your promotion and get buyers for your FJ fast and for top dollar! Advertising starts at as little as $25. For more info and to purchase advertising, click here. Red Line Buys Land Cruisers! Not wanting to go through the hassle of selling and showing your Land Cruiser? Red Line buys FJ40s, FJ55s, FJ60s, and other vintage Land Cruisers. To see if we might be interested in purchasing your LandCruiser, please click here. If you would like us to sell your Cruiser on consignment, we can also help you get top dollar for your FJ40, FJ55, FJ60 or other vintage FJ. We’ll take the pictures, shoot a custom video, list it on eBay, Craigslist, RedLineLandCruisers, and other FJ sites. Folks are always asking us to help them find them the FJ of their dreams, so we’ll work to connect you with buyers that have come to us looking for a Cruiser. We also provide options for safely and securely storing your FJ while it awaits a new buyer and can work with leading companies to ship your FJ to the new buyer. In some cases, we can arrange for pickup and transportation of your FJ ourselves. 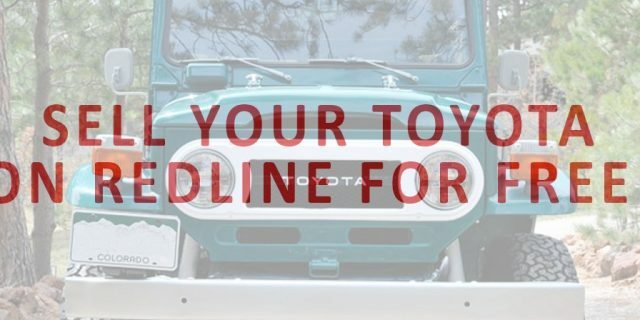 For more info on selling your Cruiser on consignment with Red Line, please call Justin at (719) 210-0101, drop Justin an email or check the box on the form below. To list your Land Cruiser on the Red Line classifieds section for free please fill out this form. If you cannot see the form below or it’s broken, you can also click here to use the basic form.